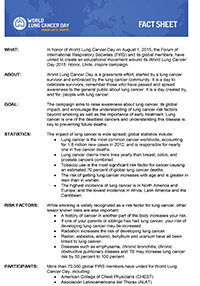 In honor of World Lung Cancer Day on August 1, 2015, the Forum of International Respiratory Societies (FIRS) and its global members including the American Thoracic Society, have united to create an educational movement around its World Lung Cancer Day 2015: Honor, Unite, Inspire initiative. 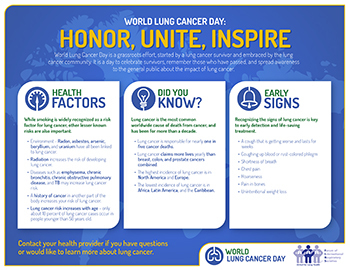 The global campaign aims to honor those who have lost their lives to lung cancer, survivors and their families, by raising awareness about lung cancer’s global impact. 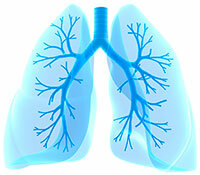 According to the World Health Organization, lung cancer is one of the most common cancers worldwide, accounting for 1.8 million new cases in 2012, and is the cause of nearly one in five cancer deaths. In fact, it claims more lives yearly than breast, colon and prostate cancers combined.